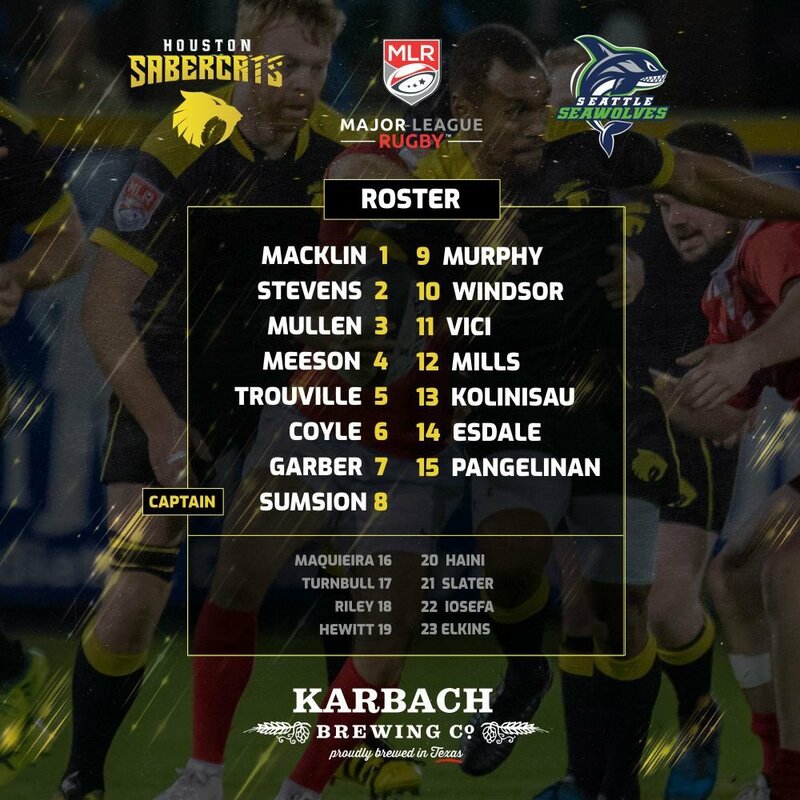 The Houston Sabercats welcomed the league leading Seattle Seawolves to Dyer Stadium Saturday night. The Seawolves were able to walk away with the 20-7 win thanks to their newly named SeaWall defense. Houston had multiple chances to score, but made simple mistakes and couldn't capitalize. Houston spent the majority of the first 10 minutes of the match with possession of the ball. They weren't able to accomplish much though as Seattle's SeaWall held up to their newly earned nickname. Houston spent a good chunk of time within Seattle's 22, but they couldn't punch though. A scary moment happened when Vili Toluta'u and Matt Trouville collided while competing for a cross field kick from Sam Windsor. Both players were able to get up and play on. Brock Staller had the first attempt at points for Seattle, but his penalty kick went just wide. Brock Staller made up for his earlier miss and put the first points of the match on the board almost 27 minutes into the match. Houston committed a penalty directly in front of the posts and Seattle seeing that the match had been a defensive battle up to this point, decided to take the points on offer. The Seawolves scrum was their strength the first half of the season, but Houston shut them down in the first half. 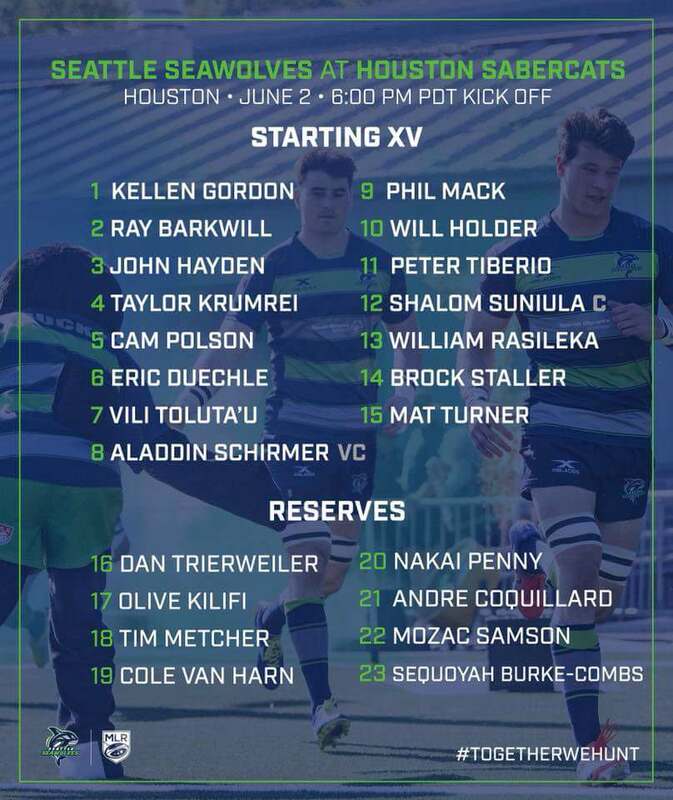 The Sabercats pushed the Seattle back on every scrum. Brock Staller added a second penalty from right in front of the sticks on the stroke of halftime that gave Seattle a 6-0 lead at halftime. A slow, defensive first half from both squads. Each team had multiple opportunities to score, but were stopped by the opposing defenses. Houston controlled the first half of the first half and Seattle controlled the second. If it wasn't for the two penalties given up by Houston, this could've been a nothing-nothing halftime scoreline. The first try of the match came 45 minutes in. Peter Tiberio ran a nice inside line through the Sabercats defense for the try. Phil Mack scored a second Seattle try. This time off a Houston mistake. Houston knocked on in the tackle directly into Mack's hands and he took it in for the try. Brock Staller converted both tries that extended Seattle's lead to 20-0. Ray Barkwill was sent off with a yellow card for a low, no arms tackle. Vili Toluta'u joined Barkwill in the bin. Toluta'u was given a yellow card for deliberately slowing the ball down in the ruck. Houston responded almost immediately, with Charlie Hewitt powering his way over the try line. Sam Windsor converted to bring the Seawolves lead down to 20-7. Seattle was able to convert the few chances they had when Houston went to sleep a little. The Seawolves SeaWall stood tall when called upon. They repelled Houston for the first ten minutes of the match and were able to keep them out of the try zone for the majority of the match. Their scrum got overpowered for a good portion of the match, so they'll need to look at the film to see what went wrong in this match. Houston's season has gone downhill since a promising preseason. They seem to be playing slow ball and they don't have anyone directly running onto the ball. They allow the defense to rush up and continuously lose meters because they don't run onto the ball. They one good thing they can take away from this match is that they were able to overpower the top scrum in MLR. Seattle is back in Texas again as they visit Austin Elite next Friday, June 8th. Houston heads to Colorado next Friday, June 8th to take on the Glendale Raptors.